i had heard about namco’s classic early shooter xevious but didn’t have much interest in it until a 3-D version of it was ported over to the 3DS. in preparation for tackling that version i spent some time getting acquainted with the version of the original that appears on namco museum megamix for wii. 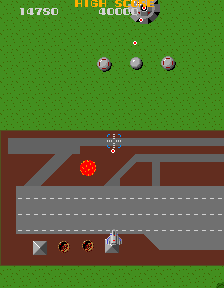 Xevious is programmed to react to the player’s behavior. If you’re too proficient at killing a certain kind of enemy, the AI will send other kinds. Similarly, when your score increases, the waves of enemies intensify. Bombing a nearby Zolbak will reduce the enemy forces’ aggressiveness for a while, making this otherwise harmless object a priority target for survival. putting historical appreciation aside, from a modern perspective i found the game to have some major drawbacks. the single boss character is difficult to get past, and there’s one set of enemies in particular (called zakato apparently) that explode almost on sight and i found almost impossible to avoid. the version on namco museum megamix provides a stage select which was welcome, but otherwise the game feels like it was designed to munch quarters. i don’t see the point in the randomly hidden bonuses, and the controls felt a bit sluggish, although that could’ve been in part due to the version i played. i did enjoy the interplay between the air vs. the ground enemies and the enemies’ unique behaviors in general. the seamless transition between stages is noteworthy, but when combined with the “skip a stage if you die more than 70% through it” feature it did make tracking my progress a bit difficult. all in all not my favorite arcade game, certainly, but enjoyable enough and a historically interesting early 2-D shooter.